Most every woman has found herself with a closet full of too many clothes or surrounded by brand-new items that somehow never get worn. Instead she gets stuck wearing the same few familiar pieces from a wardrobe that just doesn’t feel “right.” Dr. Jennifer Baumgartner argues that all those things are actually manifestations of deeper life issues. What if you could understand your appearance as a representation of your inner unresolved conflicts and then assemble a wardrobe to match the way you wish to be perceived? 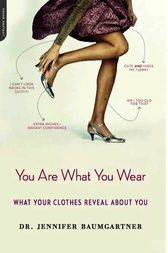 In this fashion guide that is like no other, Dr. Baumgartner helps readers identify the psychology behind their choices, so they can not only develop a personal style that suits their identity but also make positive changes in all areas of life.